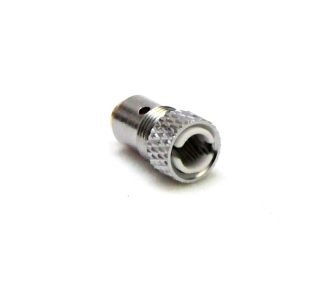 VHIT RELOAD DRY HERB ATOMIZER COIL HEAD - This item has been discontinued. The Vhit Reload Dry Herb Atomizer Coil Head is the replacement coil bowl head used in the Vhit Reload Dry Herb Clearomizer. This replacement coil head gives you the capability to remove and replace burned out coil heads. Tips: Do not overpack the chamber. This will decrease the airflow and reduce performance. It will also compress the coils and cause irreplicable damage. - Grind the dry herb finely. - Clean the chamber on regular basis. - Coil Head typically lasts 2-3 weeks with proper care.